Portable steel racks are a versatile and durable storage solution for a wide variety of applications. Designed to hold up to 1,000 lbs of weight, the carts also come in numerous sizes depending on your storage needs (see sizes below). In addition, choose from three different decking options (steel, wire, or no decking for owner-supplied plywood). The carts are made with a simple but effective design that helps you and your employees be as efficient as possible. The racks store a variety of material sizes and weights with heavy-duty casters that make transportation fast and easy. Additionally, organized and easily accessible storage translates to more efficient space usage in your facility. This makes the carts great for material distribution in warehouses, shipping and receiving areas, assembly areas, and other heavy-duty applications that require organization and transportability. See below for additional steel rack cart features and options. 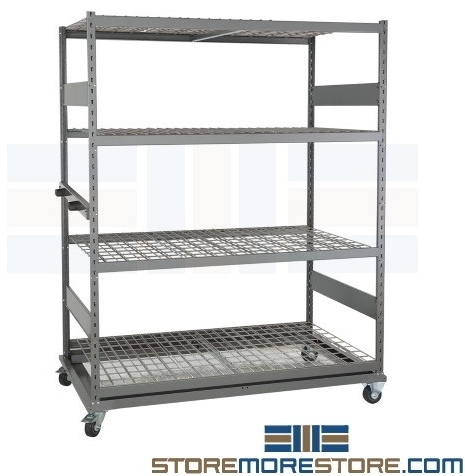 Steel racks available in 60″, 66″, 72″, and 96″ widths (add 3″ to the width to accommodate for the mobile base). Available depths include 24″, 30″, 36″, and 48″. Heights available in 63″ and 75″ (add 7″ to the rack to accommodate casters and mobile base). Medium-duty beams included on 60″ to 72″ wide units. Heavy-duty beams included on 96″ wide racks. Handled included on all except 24″ deep units. All units include 4″ casters (two rigid and swivel caster with brakes). Mobile bases designed to support up to 1,000 lbs. Adjustable shelves on 1″ increments. Available with steel decks, wire decks, or no decking (for owner-supplied wood decking). 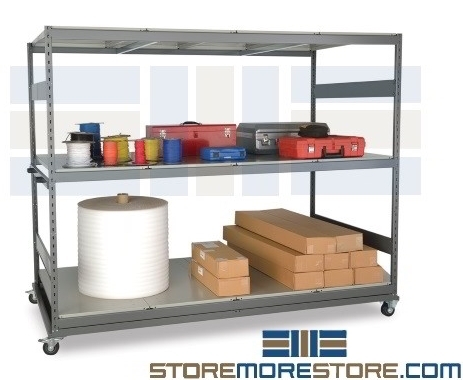 Click here to shop for portable steel racks and carts online. For further assistance, call us at 1-855-786-7667 or send us a message to speak to one of our specialists.